The First WisCon Dinner — seeking leaders and diners! We’re looking for people who have been to a few WisCons already to lead a group for the First WisCon dinner — is that you? We already have a few, but we need at least two more! If you’re interested, please email chair@wiscon.net and we’ll put you in touch with the First WisCon Dinner coordinator — and yes, leading a group is volunteer time that can count toward eligibility for a WisCon membership rebate of 40% of the registration fee! The First WisCon Dinner is our effort to welcome new attendees, share hints of what not to miss, and dispel the misperception that everyone at WisCon already knows each other. Everyone — whether it’s your first, fifth, or fifteenth WisCon — is invited to meet right outside the doors of the 2nd floor Wisconsin ballroom after the end of the first panels (between 5:15 and 5:30 pm) on Friday. We’ll organize ourselves into groups small enough to allow conversation, then each group will head to a different local restaurant chosen to suit dining preferences and your budget. Over dinner, we’ll all get to know each other and WisCon veterans will share memories and advice with new arrivals! It’s a wonderful way to spend the first evening of the convention. WisCon relies on volunteers for all aspects of convention-planning and to ensure a successful and enjoyable weekend for everyone. We still have a variety of volunteer shifts to fill in many departments and these volunteers are critical to our success. Please contact us at volunteers@wiscon.net for more information on openings, if you have any questions, or to sign up. Please consider joining us for a shift or more during the convention! Children’s Programming — Needs 2 people each for Saturday and Sunday from 1-3:45 pm. A background check will be required. Logistics — Looking for someone local to help with directing the movers for convention set up and tear down. A/V — Could use a couple volunteers to help with set-up before major events, programming, and parties throughout the weekend. Con Suite — This area is often understaffed. We need volunteers the entire time the Con Suite is open to provide hospitality to convention goers. We also have a need for a few more volunteers who are ServSafe certified or willing to become certified. Art Show — This area is also often understaffed. Volunteers are needed to help with set up, tear down, sales, and during the show preview (on Friday night). We have a schedule set-up with lots of openings. Access — Needs 1-2 people throughout the convention to set up blue tape (early mornings and before Opening Ceremonies, the Tiptree Auction, and the Dessert Salon). Green Room — Needs volunteers throughout the convention as programming runs. Registration — Is open almost the entire convention and needs volunteers throughout. Safety — Various shifts open throughout the weekend. Training provided. Tiptree Bakesale — Needs volunteers for 1-hour shifts from 11am-4pm on Saturday. For volunteers interested a more serious time commitment with possible conversion to a ConCom position for Wiscon 41, the Gathering needs an at-con lead! The Gathering is the official start to WisCon — every year on Friday at 1pm sharp! The Gathering is a fair full of fun, free activities. This is the time and place to decompress from the rigors of travel, meet friends old and new, make the transition to WisCon space-time, and get into the WisCon frame of mind! 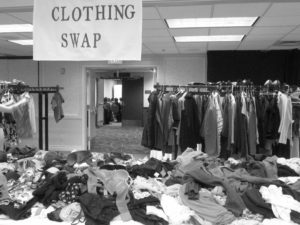 Most of our pre-con Gathering tasks have been handled already, so the remaining set-up will involve: bringing Gathering items out of Storage, making last-minute adjustments to layouts, and fielding donations (books, clothes, nail polish). During the Gathering itself, the at-con Gathering lead is available to give short breaks to volunteers who staff their tables. All volunteers this year will receive a WisCon logo water bottle as a “thank you” gift. Volunteer six or more hours and you will be eligible to request a volunteer rebate. What in the world is “the ConCom”? It’s a word you’ll see thrown around WisCon on a regular basis, but what does it mean exactly? “ConCom” is short for the WisCon Convention Committee. 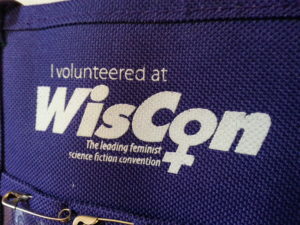 The WisCon convention is a project of the Society for the Furtherance & Study of Fantasy & Science Fiction (aka SF3). Projects of SF3 are assigned to a committee, and so the volunteers who plan and run WisCon are part of the convention committee. Are you interested in stepping into the wings and joining the convention stage crew? The ConCom welcomes everyone who’s interested — whether you have convention-planning experience or not, whether you have knowledge in a specific area or not. Some of our members came ready to share their knowledge of communications or nonprofit budgets or developing apps, and some of our members joined ready to just help out wherever we had a gap. We can find a place for you! You don’t even need to be local to Madison! Most of our ConCom members live elsewhere. The ConCom meets monthly via a conference/internet call, and stores, organizes, and discusses work using Basecamp. ConCom work usually starts in the autumn with our first meeting in September, then gets busy in earnest in January. We have a wrap-up meeting in June, and for the rest of the summer ConCom obligations tend to be light for most departments. If you’d like to make a general inquiry about joining the ConCom, please contact us at the email above. All ConCom members get the volunteer “thank you” gift, and ConCom members are eligible to request the volunteer rebate.